There’s a lot more in common between Major League Baseball executives and maintenance professionals than you may think. While they may seem like very different callings, they’re united by one, simple idea; Moneyball. Moneyball is the concept of maximizing resources and exploiting inefficiencies to control costs and increase return on investment. While general managers around the MLB look for a championship team on a budget, maintenance managers have their eye on optimizing equipment for better production. Analyzing a stream of numbers can lead to more wins on the diamond, just as scrutinizing key maintenance metrics can lead a manufacturing facility to new heights. The term Moneyball was coined by author Michael Lewis in the early 2000s and has been adopted in almost every industry since, although it’s remained an elusive goal for many maintenance managers. Now, with a host of sophisticated digital technologies more accessible to manufacturers than ever before, maintenance professionals can use the tenets of Moneyball to discover how to spend less, make more and maximize resources by identifying inefficiencies in their operations. This takes a combination of measuring and analyzing the status quo and instituting a balanced maintenance strategy to eliminate the inefficiencies that cause costly emergency breakdowns. Here are eight ways that introducing new technology can help you uncover inefficiencies and help your facility control maintenance costs across the board. Having an information hub available in a mobile maintenance app that details the asset history and can speed up the process of fixing a piece of equipment if it goes down. Even cutting downtime by the five minutes it takes to retrieve a manual from the office can save companies hundreds of thousands of dollars a year. Scrap and rework happen when production systems break down. It often leads to increased energy use and lost product, which does double damage to your bottom line. Getting a digital maintenance system—like a CMMS—in place allows maintenance teams to schedule preventive maintenance more effectively to reduce the likelihood of breakdowns that cause scrap and rework. It can be difficult to make an educated repair or replace decision on an asset without a database of information about that equipment. A digital platform allows maintenance team to accumulate, sort and analyze detailed and accurate asset data to discover which assets are being repaired on a recommended basis and when it would be more cost effective to invest in a newer, more efficient piece of equipment. . . .maintenance professionals can use the tenets of Moneyball to discover how to spend less, make more and maximize resources by identifying inefficiencies in their operations. Digital maintenance software makes it easy to calculate important KPIs and advanced metrics from assets. Having these metrics on-hand can eliminate redundancies and fine-tune maintenance practices to cut costs. For example, mean time to repair (MTTR) provides insight into predicting the life cycle cost of new systems, which helps maintenance teams make smarter purchasing decisions. Creating a digital inventory of parts eliminates reliance on messy and often inaccurate pen and paper inventory tracking. Having a firm handle on stock levels saves everyone time and money. Proper inventory tracking prevents duplicate ordering, sets minimum levels and reorder quantities, and identifies surplus parts that could be returned for a rebate. A digital platform keeps maintenance teams on schedule for planned checks and repairs. These preventive strategies keep machines and systems running efficiently and using less energy. Less energy means fewer costs. Adhering to maintenance schedules and keeping systems in like-new condition ensures efficiently, and limits the impact equipment has on the environment. With new technologies, maintenance teams no longer have to analyze budgets and expenses in different spreadsheets with little to no context. Tracking all expenses in one place and associating these costs with specific assets or work orders allows you to see where money was spent, identify areas that are running over, and make educated repair or replace decisions. 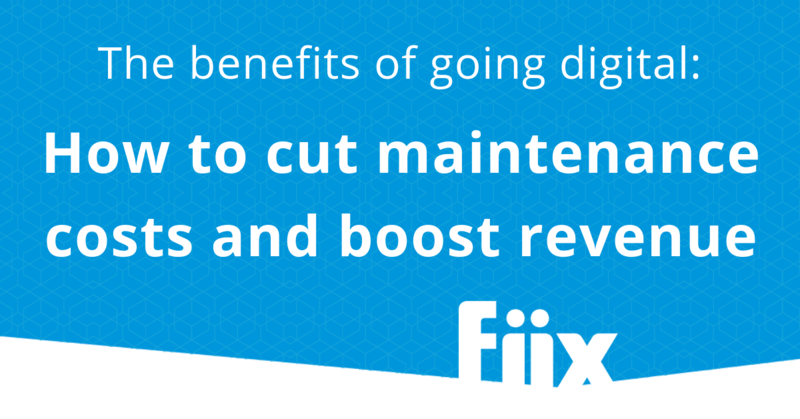 Now that you know how digital maintenance can be used to control costs, here are six tools from the Fiix CMMS that can help you cut expenses, eliminate inefficiencies and spend more effectively. The ability to submit work orders and prioritize them right in the software helps maintenance managers know what work needs to be done and keeps small projects visible so they don’t fall through the cracks. This makes the work order process more efficient, which helps eliminate backlogs and cuts downtime costs. The CMMS allows maintenance teams to build a mobile library of resources by uploading documents, videos, manuals, schematics and other helpful pieces to the software, attaching them to assets and accessing them wherever and whenever. Not being bound by paper or physical documents means less downtime and fewer associated costs. Even cutting downtime by the five minutes it takes to retrieve a manual from the office can save companies hundreds of thousands of dollars a year. Fiix’s reporting module helps maintenance teams forecast scheduled maintenance and allows them to sort by equipment by total and average repair costs. The online/offline tool can also track which assets break down the most and their total and average downtime. This gives maintenance managers solid numbers they can use to make repair or replace decisions and design a balanced maintenance strategy to maximizes labour costs. The root cause analysis (RCA) feature records the most common problems associated with an asset or asset group and why they happened. This helps maintenance managers target the root cause of equipment failure and implement strategies that will make tasks more efficient. For example, the RCA might identify that a machine’s preventive maintenance trigger is too high. Based on this, the trigger can change and the equipment can be maintained better with more uptime and fewer parts and labour costs. Fiix’s inventory tools allow technicians and maintenance managers to check online to see if a part is available rather than physically checking. This prevents redundancies, helps fine-tune ordering processes and track surplus parts. In short, the CMMS system can take the place of an ERP system for inventory control, cutting the costs of a separate system. Fiix’s scheduling and calendar tools allow maintenance teams to coordinate preventive maintenance tasks at a time that is best for the flow of production. Optimizing preventive maintenance schedules means work gets done on time and downtime is reduced. This leads to less scrap and rework and energy consumption. Controlling the costs associated with these two elements could be a huge boost to any manufacturing operation.